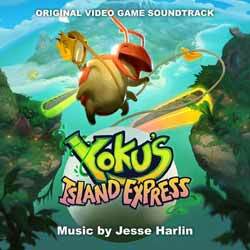 One thing is evident in Jesse Harlin's music for Yoku's Island Express: You get a diverse and engaging selection of themes. There's no denying that the music is very much a character of the game. You'll hear everything from beat boxing to bebop, medieval madrigals to chiptune basslines, and sinister reggae to Keystone Kops-styled piano chase music. There’s a song with pinball machine sounds in the percussion tracks, and that same track has banjo, ocarina, talking drum, and a drunken trombone. There’s even one track that uses the DNA sequence of yeast run through a robot-voice generating vocoder as part of the backing track. There's a bit of an Edge of Darkness (Eric Clapton) vibe on tracks like 'Out Down In The Underdark' and 'The Crystalline Depths' as well as old skool console game music inspiration on tracks like 'Monk Stumpin'. The album contains 14 (46 min, 43 sec) engaging and fun tracks. If you're a fan of the game you'll already know how engaging this music is.